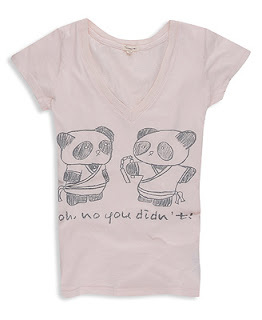 Kung Fu Pandas ← You Want Me To Wear What? Okay, am I missing something? No, seriously. I do not get this t-shirt, to the point where I’m wondering if it’s just absurdist and intentionally devoid of meaning. What is happening here? Did one panda anger the other panda? Are they mad over the deforestation and human encroachment on their habitats? Did they find Kung Fu Panda to be an offensive stereotype? Why are these pandas so upset? Is it at each other, or an unseen foe? Is the intent of the shirt that the wearer is saying, “Oh no you didn’t”? If that’s the case, and this is a shirt from the wearer’s perspective, should the viewer then stand to reason that the wearer is threatening them with ninja pandas? Yeah, I’m guessing that’s what the meaning behind this shirt is – don’t piss me off, or I’ll send my ninja pandas to attack you.